It has been rumored that McCabe had much earlier indicated to sycophants that if he goes down he's taking a great deal of the top actors [ in the Obama regime] with him. 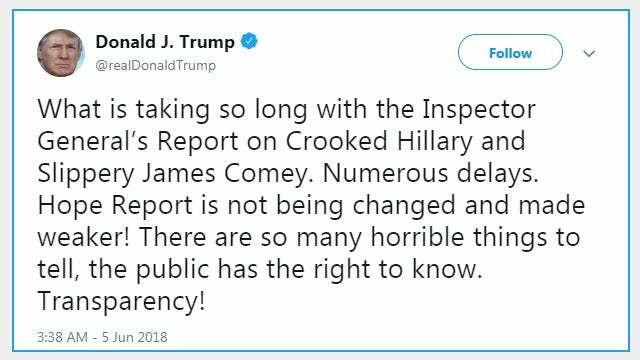 "Trump tweeted this morning, “What is taking so long with the Inspector General’s Report on Crooked Hillary and Slippery James Comey. Numerous delays. Hope Report is not being changed and made weaker! There are so many horrible things to tell, the public has the right to know. Transparency!” [sic] We’ve been hearing about the inspector general report for weeks now. It has been imminent for weeks. (For those of you in Rio Linda, “imminent” means “any moment.”) Now, what has been going on with this? Remember, the people in the establishment will circle the wagons and protect each other. I mean, there is some competition within the ranks, as there is anywhere. But when they’re under siege, they will circle the wagons and protect each other. Not a single leak, folks. Does that not tell you something? 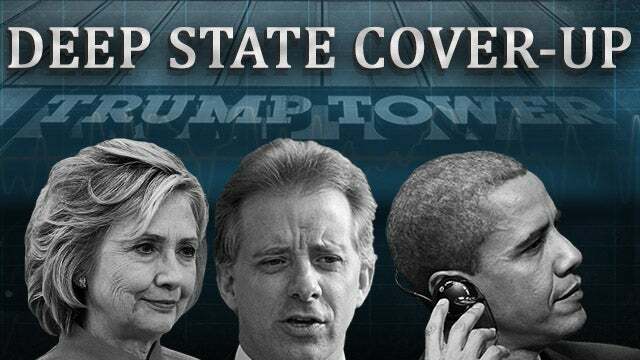 When everything else in that town is leaking like Swiss cheese and not one leak from the IG report." "Under the terms of such a grant of use immunity, no testimony or other information provided by Mr. McCabe could be used against him in a criminal case," wrote Michael Bromwich, a lawyer for McCabe, to Senate Judiciary Chairman Chuck Grassley, who has requested McCabe testifies next week. Grassley, an Iowa Republican, has quietly requested that several former officials appear in front of the Judiciary Committee to discuss the long-awaited internal Justice Department report, which sources say will detail a series of missteps surrounding the Justice Department and FBI's investigation into Clinton's handling of classified information while secretary of state. The inspector general's report has not yet been released, but Grassley has invited former FBI Director James Comey and former Attorney General Loretta Lynch to testify as well, according to those familiar with the plans. The stakes for McCabe's appearance, however, are particularly high. The former No. 2 at the FBI is entangled in a separate criminal investigation stemming from an earlier report from the inspector general's office that concluded he lied to internal investigators. McCabe has steadfastly denied wrongdoing, but any congressional testimony he provides could have serious implications for his criminal case. "Mr. McCabe is willing to testify, but because of the criminal referral, he must be afforded suitable legal protection," Bromwich wrote to Grassley. "This is a textbook case for granting use immunity. . . . If this Committee is unwilling or unable to obtain such an order, then Mr. McCabe will have to no choice but to invoke his Fifth Amendment privilege against self-incrimination." If McCabe invokes his Fifth Amendment right instead of answering certain questions, it could set up a contentious confrontation with lawmakers. They could serve him with a subpoena and if he continues to refuse to testify, lawmakers could pursue a contempt resolution against him and refer the matter for prosecution by the DC US Attorney's Office or enforce the subpoena through civil action in federal court. Bromwich's letter also makes clear that McCabe is willing to provide emails that "demonstrate that Mr. McCabe advised former Director Comey, in October 2016, that Mr. McCabe was working with FBI colleagues to correct inaccuracies before certain media stories were published." The discrepancy between Comey's recollection and McCabe's statements to internal investigators about authorizing FBI officials to talk to a reporter about an ongoing investigation regarding the Clinton Foundation in 2016 served as one of the linchpins to the inspector general's earlier report finding he "lacked candor." McCabe was fired from the FBI in March less than two days shy of his retirement after rocky final months of service. During the 2016 campaign, then-Republican presidential nominee Donald Trump latched on to a report that McCabe's wife accepted nearly $500,000 from the political action committee of then-Democratic Virginia Gov. Terry McAuliffe, a Clinton family ally, during a failed bid for state Senate in 2015. Though McCabe was not promoted to deputy director at the FBI until months after his wife lost the race, Trump continues to assert on Twitter that McCabe had a conflict of interest in later overseeing the FBI's investigation into Clinton's use of a private email server, given the donations to his wife. Grassley has set the Judiciary hearing for next Monday, but it could be delayed, as the inspector general's report -- while a moving target -- is still not public yet. Sources familiar with the report described it as a massive undertaking, walking through the events leading up to the 2016 election over roughly 500 pages." Now, we'll begin to see how the entire debacle will take shape, this, based on the pieces that have been haphazardly cobbled together over the past 16 months. Moreover, with the very strange tones recently emanating from all the major media players in the Fake News sector, this could be epic, indeed. Rest assured, this will change the entire narrative going forward, once it fully gets out, nevermind McCabe's testimony; and Trump will almost certainly NOT be on the receiving end.